July 17  At 5 am, we were again awakened by our friendly red squirrels, but we refused to get up until 8 am. We had clear skies, but were faced with a repetition of the previous day - a cool wind again  I suspected that the wind would die down as the morning progressed and, in turn, the waves would subside. 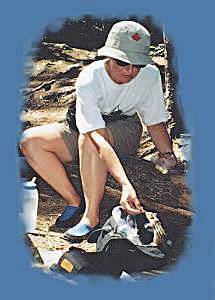 While I was preparing a hearty breakfast, Geri went for her brisk walk around the campgrounds. 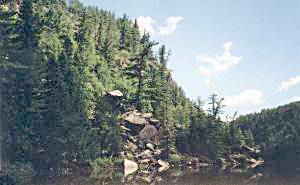 As the sun became warmer, we decided to tackle the Barron Canyon and by 11 am, we had driven the 8 km to the Brigham parking lot and commenced to descend the steep, rocky 200-metre portage to the Brigham River. Thankfully, my experience in portaging this kind of terrain prevented any damage to the bow and stern from protruding objects. Unfortunately; however, my experience did not alleviate the effort involved! At the base of the decline, we followed a shallow stream and its series of rapids to the point of entry. The narrow, shallow stream was engulfed with plant life and submerged rocks and logs and caution was a priority until we reached Brigham Lake. At the left corner of the lake, among the thick cover of lily pads, we gingerly maneuvered our canoe between the narrow opening of a rock and a fallen log. At this time, we could hear and identify the sound of rapids as we pushed towards our next 100-metre portage. 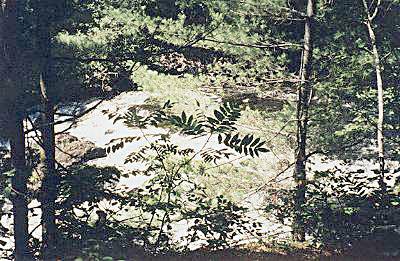 We proceeded up and over the rutted, rocky path that took us to the foot of the rapids and the entrance to a small pond. Once across the pond, we could hear the louder roar of Brigham Falls  we just had to stop and marvel at its cascading splendor over jagged and fallen boulders. At the top of the falls, I spotted a large, well-used, metal ring anchored to the rock surface  this ring would have been used to secure log booms in days gone by and was there only as a reminder for us today. We reached the Barron River, after maneuvering another demanding 400-metre portage, where we had to walk our canoe a short distance through a shallow, but very refreshing stream to deeper waters. 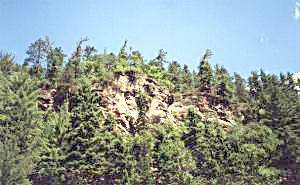 As we entered the winding Barron Canyon, we began to notice numerous high rock projections on the cliffs  these cliffs are part of the Canadian Shield, a huge area of ancient, hard, crystal-line rocks, referred to a "gneiss" (nice) that were formed during the last Ice Age, some 11,000 years ago. The canyon was formed along the line of weakness made by a fault and has been enlarged to its present gaping proportions by erosion of the rocks on either side of the fault itself. On both sides of the canyon, we came upon rock slides known as talus slopes that only added to this wondrous mystic of river and canyon. On some lime encrusted rock surfaces, bright orange plant life called lichen was clearly visible and added character and colour to the surroundings. The only distinct sounds that echoed throughout the canyon were birds, such as the Yellow-bellied Flycatcher, the Northern Water Thrush, the Common Yellowthroat, and Barn Swallows and Phoebes. 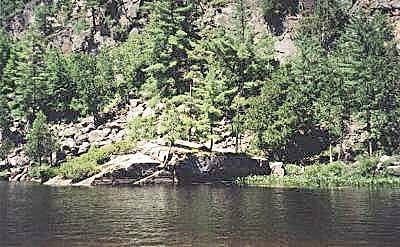 Looking carefully, we began to see various facial figures/features among the rocks and depending on the angle they would constantly change as our canoe sauntered along the river. Geri noticed one distinct feature of a native warrior while I noticed one resembling that of a centurion. Allowing our canoe to slowly drift on its own, we identified birds and animals, cats faces and medieval characters protruding out from the towering cliffs  we just let our imagination take over  a very enjoyable experience. 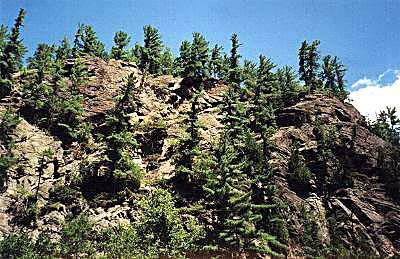 By 1 pm, we had passed through a narrow opening among the cliffs that brought us to the end of the canyon where we noticed a cleared area among the trees that resulted in an ideal place to have a picnic. 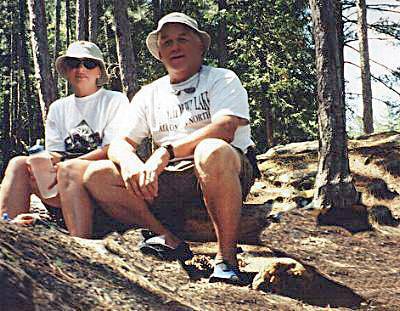 As we approached its banks, Geri laughed and pointed out our welcoming party  an excited and enthusiastic chipmunk appeared, jumping up and down on a rock as if to say, "over here, over here"! We soon realized that, to this little, clever creature, we were just another one of his regulars. As far as he was concerned, we couldnt get our lunch out fast enough. He impatiently scurried upon our legs, arms and shoulders and finally into our nap sack. Once his hunger had been satisfied, we watched as he began to store away his "goodies". During his antics, a second chipmunk came forth for a handout, only to be chased away. During our picnic and chipmunk entertainment, we enjoyed a splendid view of the canyon, watched passing canoeists as they entered the canyon and especially took in the tranquility of the area. On our return trip, we noticed a log head with a small coniferous tree and moss growing upon it in the middle of a cove - these growths are rare, but amazing when found. Travelling in the opposite direction, the canyon took on a whole new perspective with different features. At times, we had to back track in order to recapture a particular image. Halfway through the canyon at its highest point, I noticed a person in white clothing standing and looking over the cliffs edge  she appeared so small, and perhaps she was saying the same thing looking down upon us in our canoe. Just as we were leaving the canyon, a blue heron took flight from its perch along the embankment and for the longest time, its wingspan could be followed deep within the canyon walls. At the first portage, we met a family whose children were having a great time playing in the shallow rapids. We would soon learn that they were our camping neighbours at Achray Campgrounds. The return portage did not seem as difficult this time  perhaps it was because of the food we fed our chipmunk friend and didnt have to carry. At the foot of the rapids at the entrance to the small pond, we met two canoeists fishing  they had caught three bass; however, they released them back to nature, as it should be in this park. Crossing Brigham Lake, we noticed a large crane gliding along the far shoreline, and shortly thereafter, taking sanctuary among some tall reeds. It seemed to stay just slightly ahead of us until we entered the mouth of the Brigham River where this magnificent and graceful crane took flight again to safer surroundings, leaving us to paddle against a current to the completion of our trip to the Barron Canyon. We still had one more obstacle to face, our last portage with its steep and arduous climb to the parking lot  200 metres straight up. There, we had a pleasant surprise of being greeted by a very energetic young dog and we were very relieved to see his owner make his appearance shortly after. By 4:30 pm, we were back at our campsite and the both of us immediately enjoyed a refreshing swim in the lake. Geri then relaxed with a book under the pines while I was able to update on my journal over a cold beer. As I looked out over the calm lake, I couldnt help but think that our trip today was the best by far. 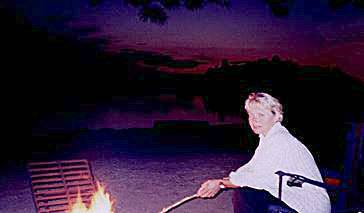 After supper, we went for our traditional walk around the campgrounds and then sat around the campfire to watch another spectacular sunset that seemed to engulf the whole length of the lake. The stars in the sky were plentiful this warm evening and the sounds of the fire and serenading of the loons and bullfrogs made for a perfect ending to our active day. Sleep again came very easily.